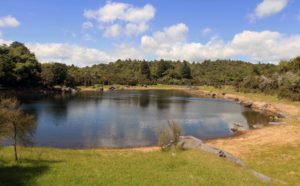 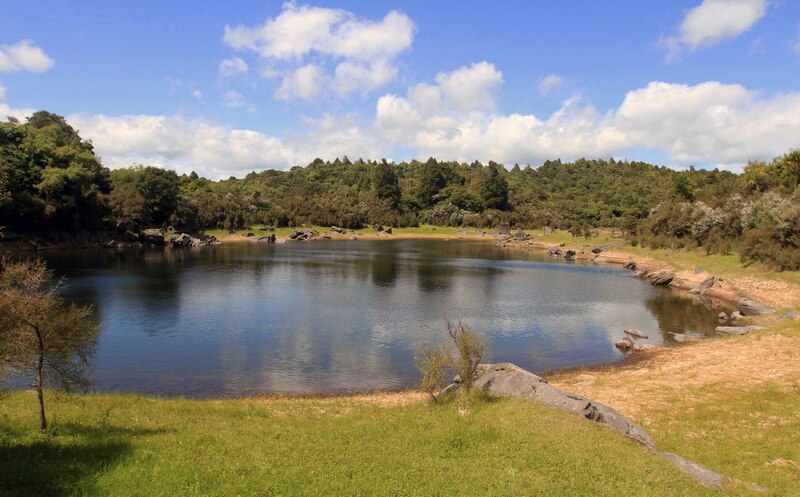 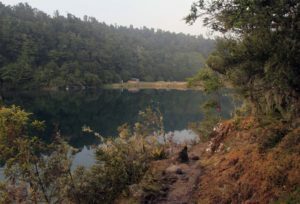 Lake Kiriopukae, a small lake located just south of Lake Waikaremoana, near the Onepoto Bay start of the Lake Waikaremoana track. 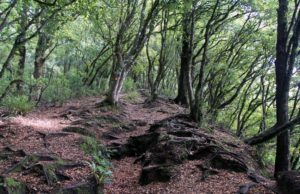 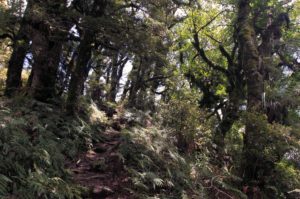 Lake Waikaremoana track, climbing up the ridge of Panekire Range. 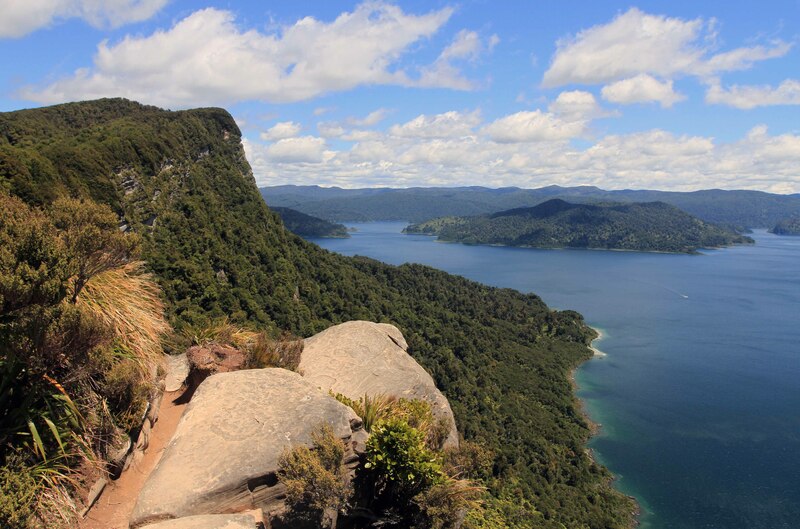 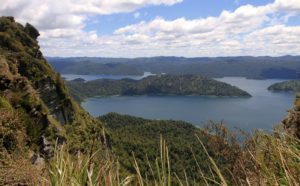 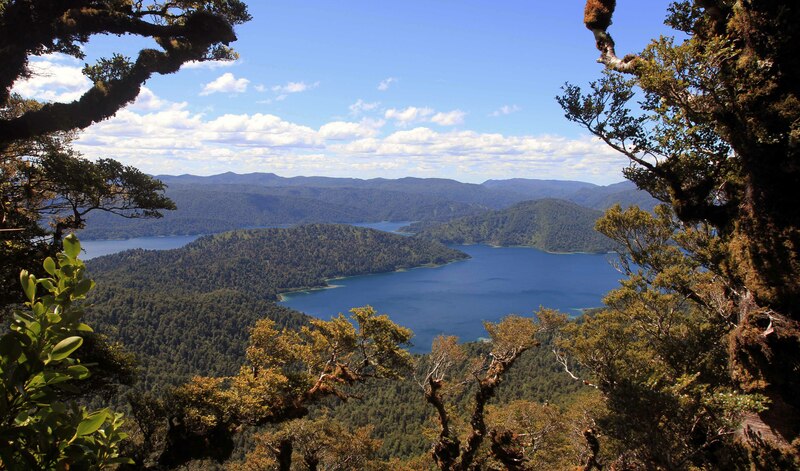 Overlook of Lake Waikaremoana and the Panekire Range. 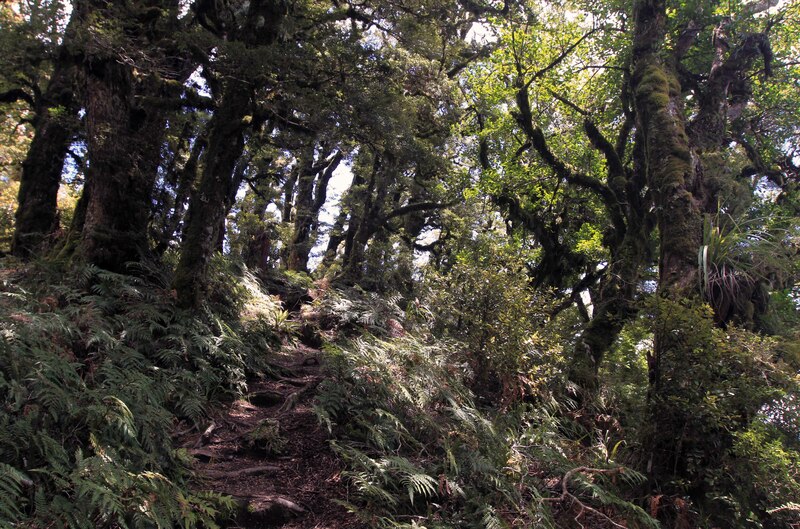 Climbing up another portion of the trail, through ferns and trees. 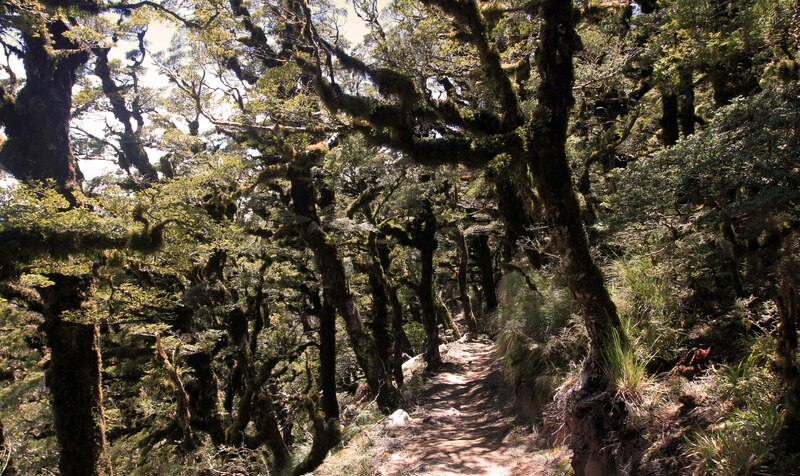 Hiking through mossy trees on the trail. Another view of Lake Waikaremoana from the trail. 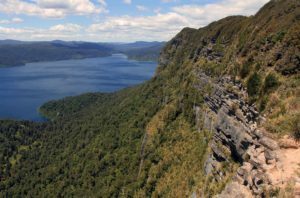 Looking east from the track, at Lake Waikaremoana and the cliffs on the Panekire Range. 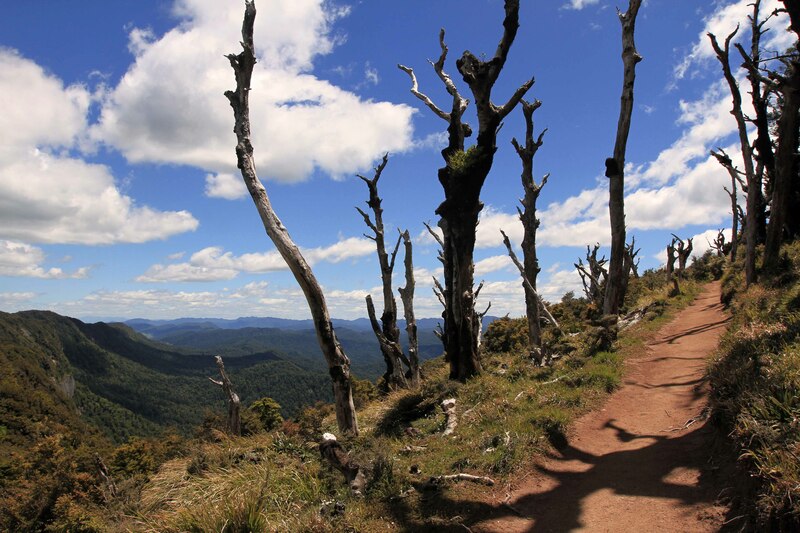 Dead trees along a side trail on the Panekire Range. View of the Panekire Range. 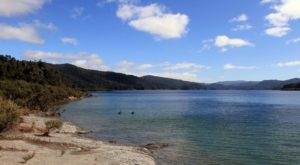 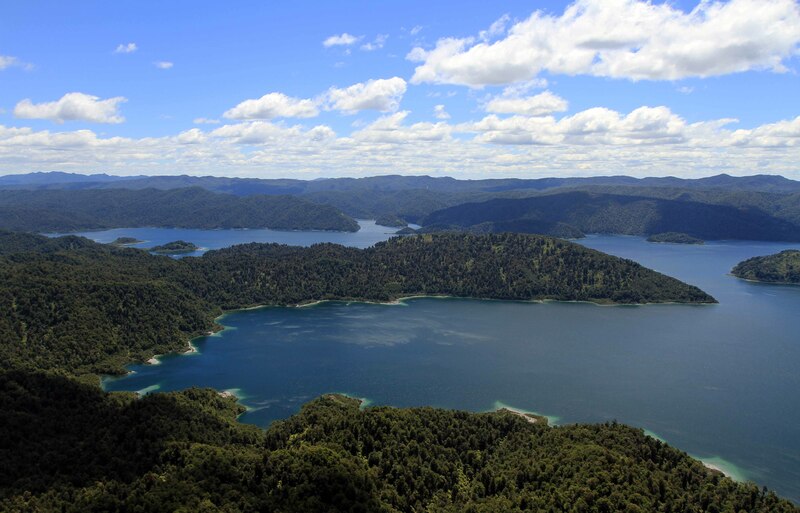 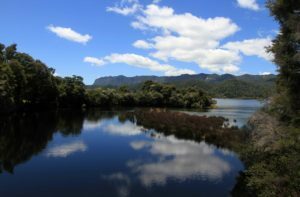 Another view of Lake Waikaremoana. 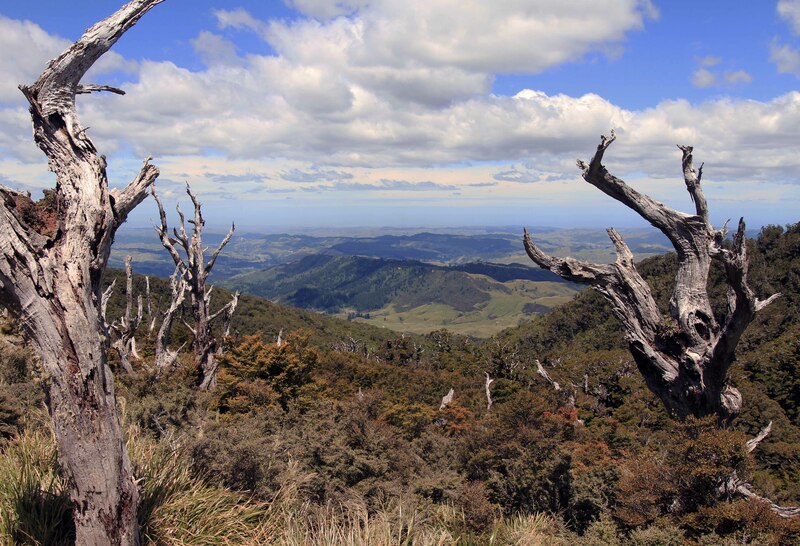 Looking east, toward the Pacific Ocean (not really visible in this photograph). 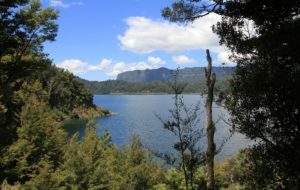 View of Lake Waikaremoana from the track. 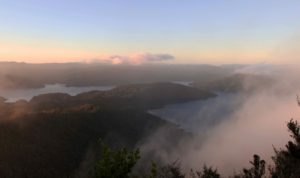 View of Lake Waikaremoana at sunset, from Panekire Hut. 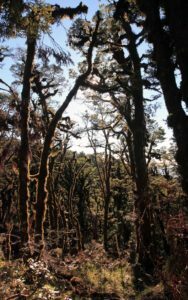 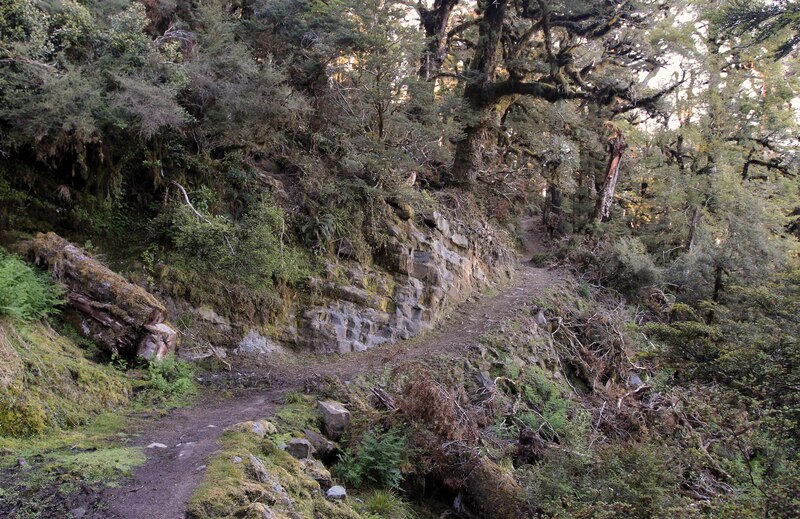 The trail along Panekire Range in the early morning. 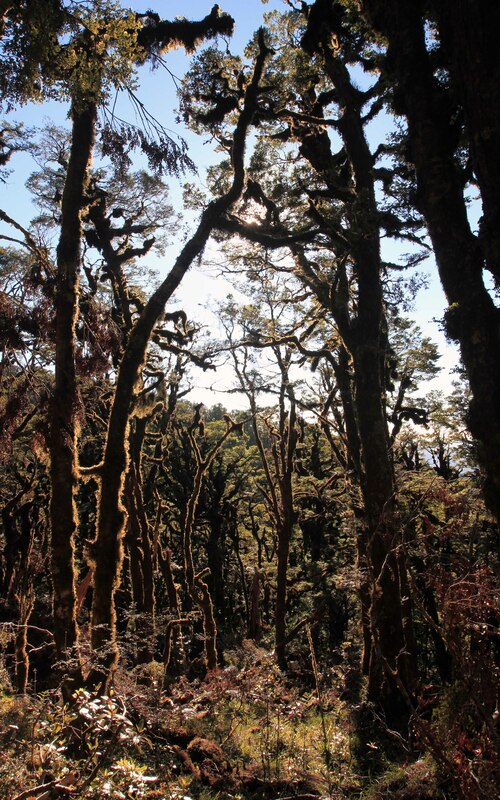 Moss covered trees in the early morning light. 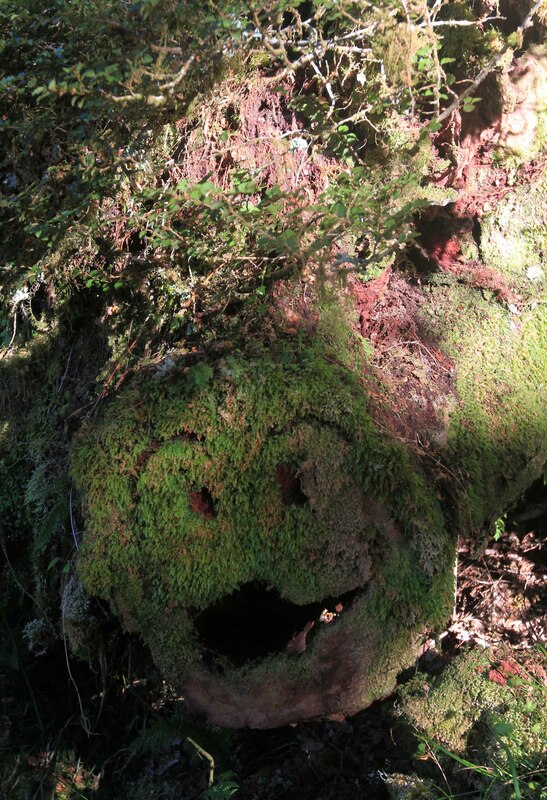 A smiley face carved into a sawn log, found along the trail. 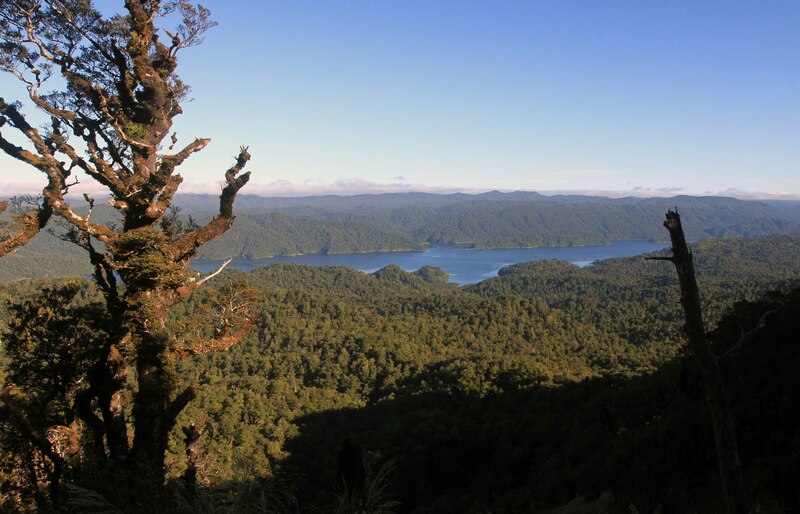 Looking back at Lake Waikaremoana from the western end of Panekire Range. 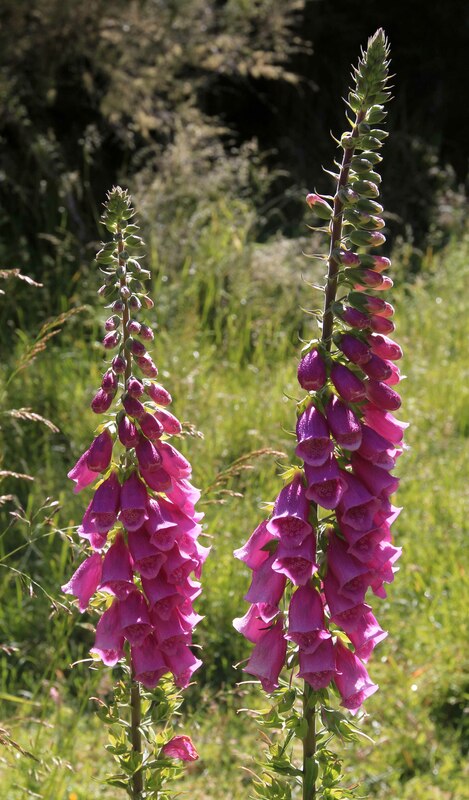 Foxglove flowers found along the trail. 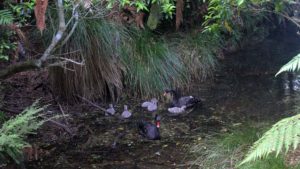 Two black swans near the shore of Lake Waikaremoana. 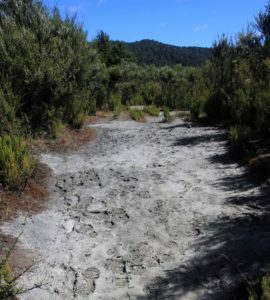 Hikers’ footprints, dried in the mud, along the track by the lake. 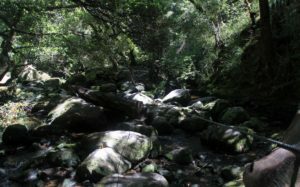 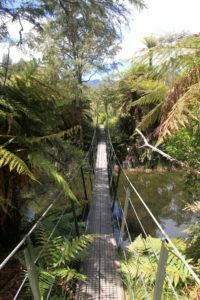 Steel cable used to help hikers cross Korokoro Stream, on their way to Korokoro Falls. 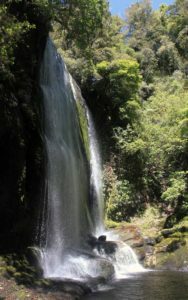 Another view of Korokoro Falls. 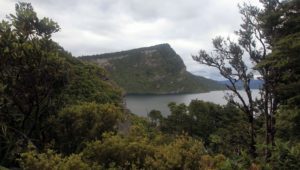 Panekire Range seen in the distance, from an inlet along the trail. 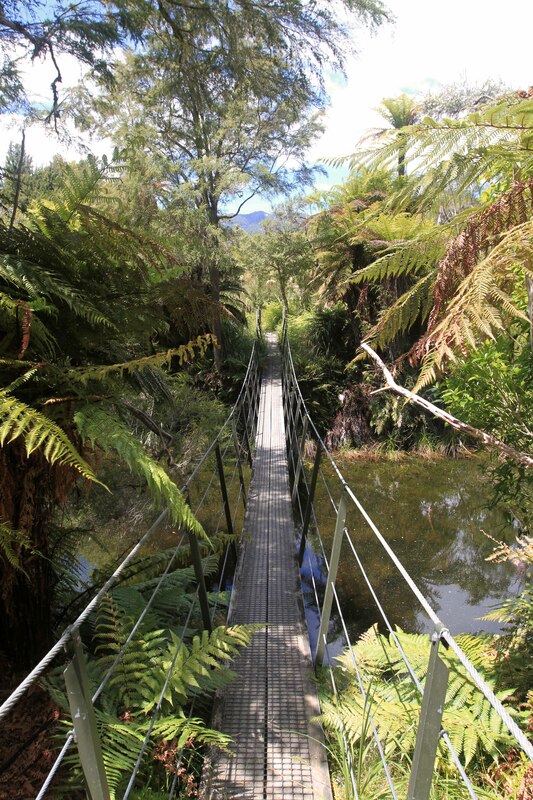 Swing bridge on the trail. Tree fern covered with numerous dead fronds. Looking back at Panekire Range on the opposite end of Lake Waikaremoana. 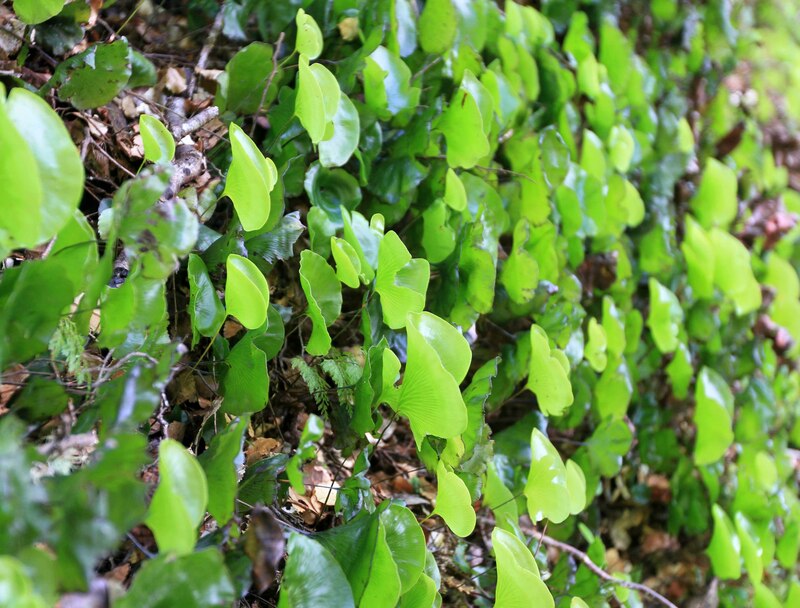 Small plants found on the forest floor. 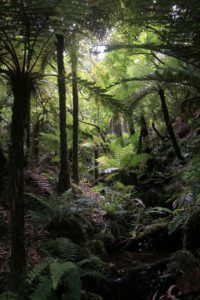 Tree ferns and a small stream. 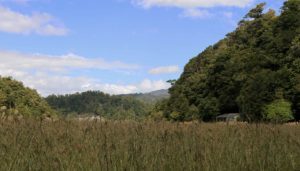 Marauiti Hut, seen at the other end of the meadow. 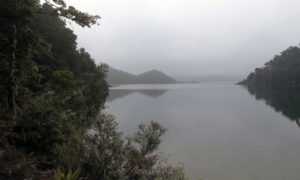 Lake Waikaremoana during the misty morn. 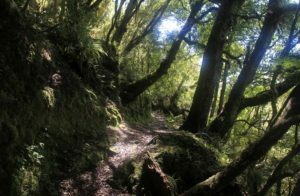 Looking back at Marauiti Hut from the trail during the early morning. 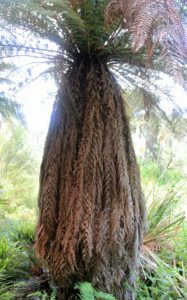 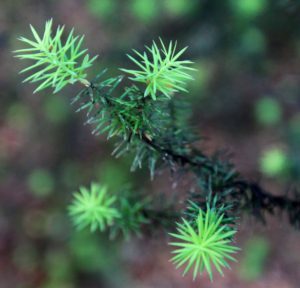 Closeup of the needles on a New Zealand podocarp tree. 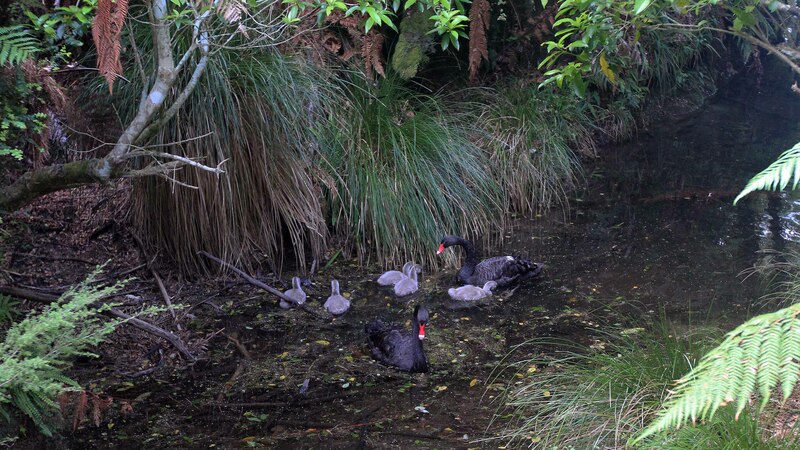 A family of black swans. Swing bridge over an inlet. 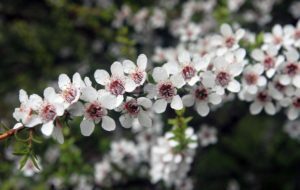 Mānuka flowers (Leptospermum scoparium), which bees use to make mānuka honey – an expensive honey sold in New Zealand and Australia which supposely has antibacterial properties if consumed. 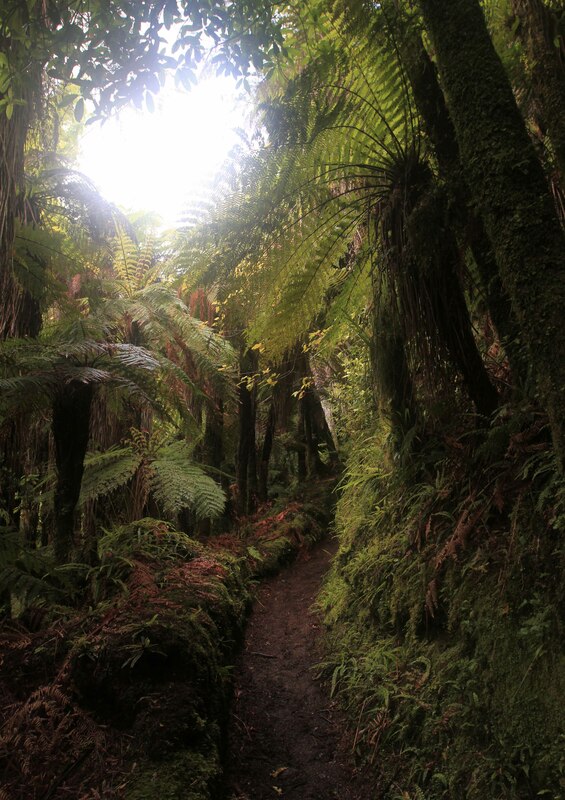 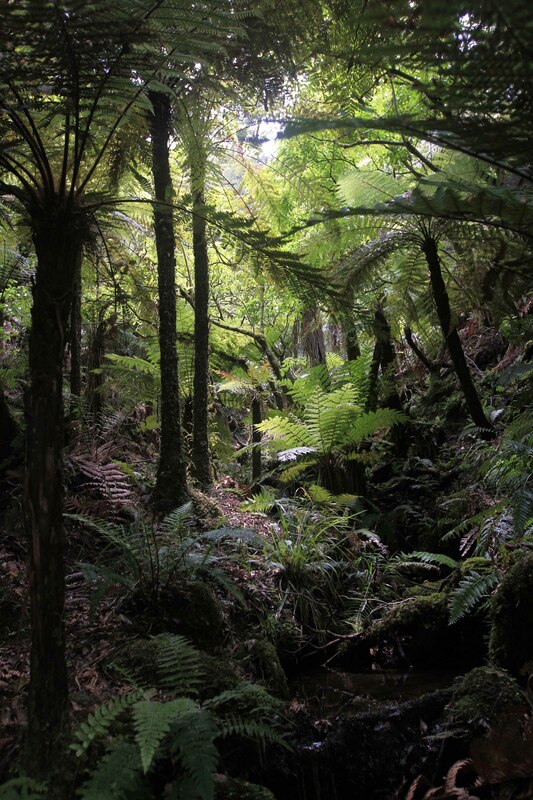 Hiking under the tree ferns on the trail. 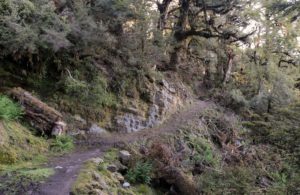 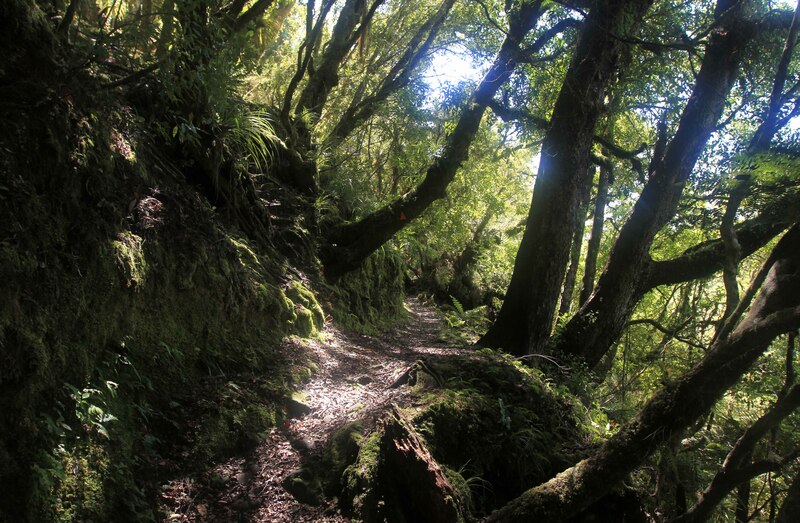 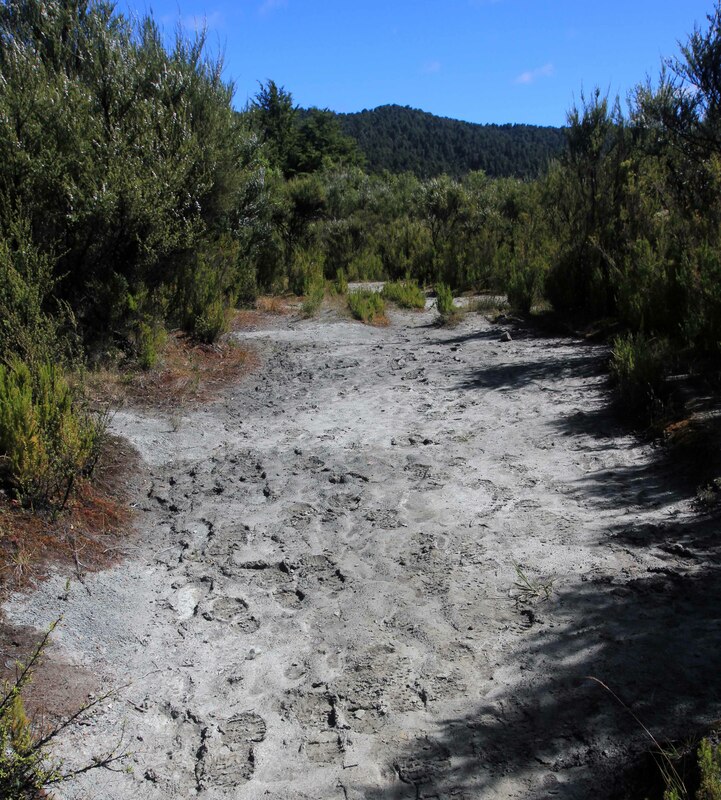 Part of the trail shortly after passing by Whanganui Hut. 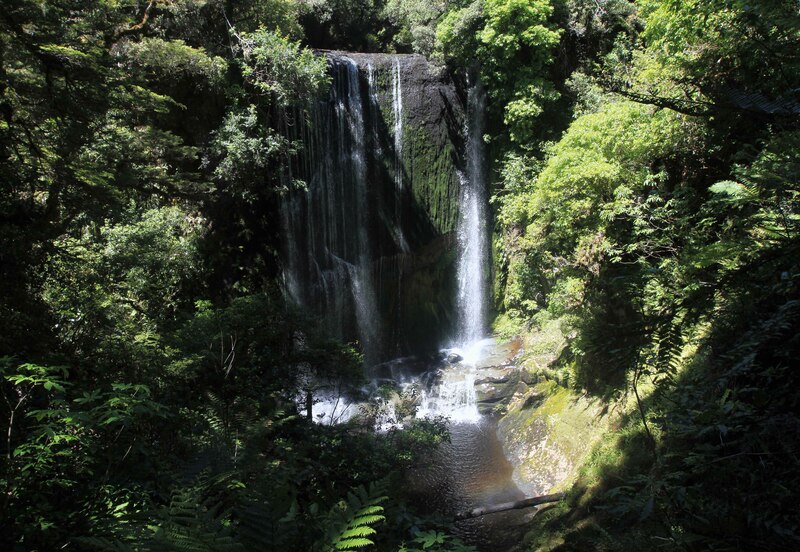 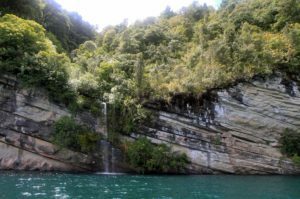 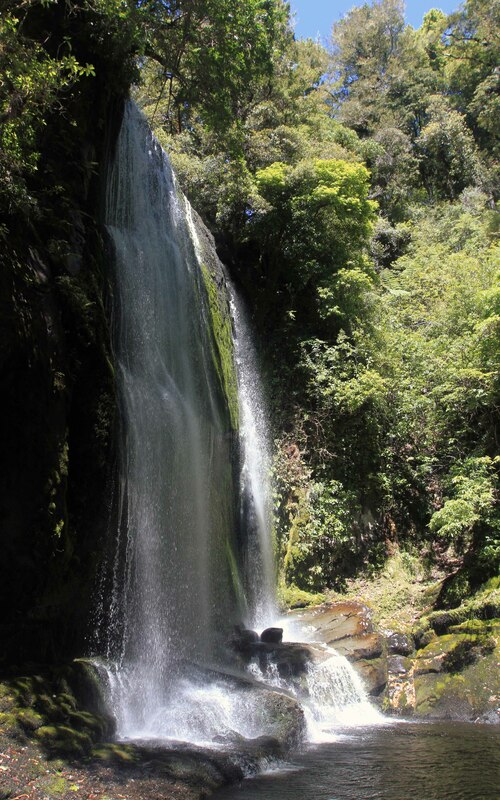 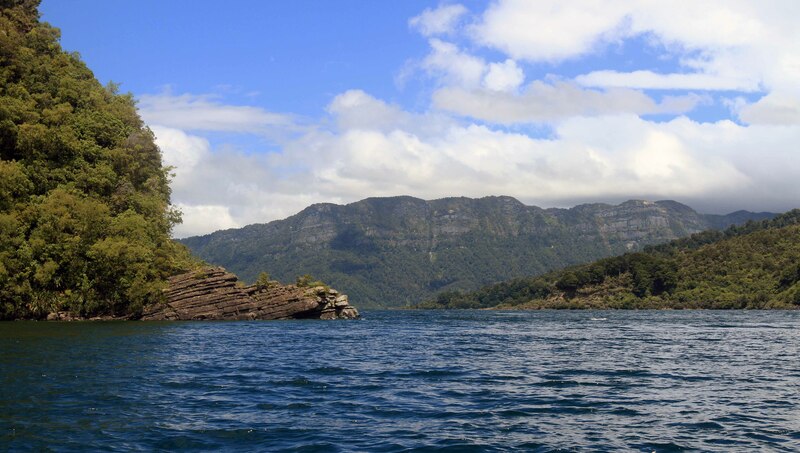 A waterfall on Lake Waikaremoana – seeen during my water taxi ride across the lake. Panekire Range, seen from the water taxi on Lake Waikaremoana. 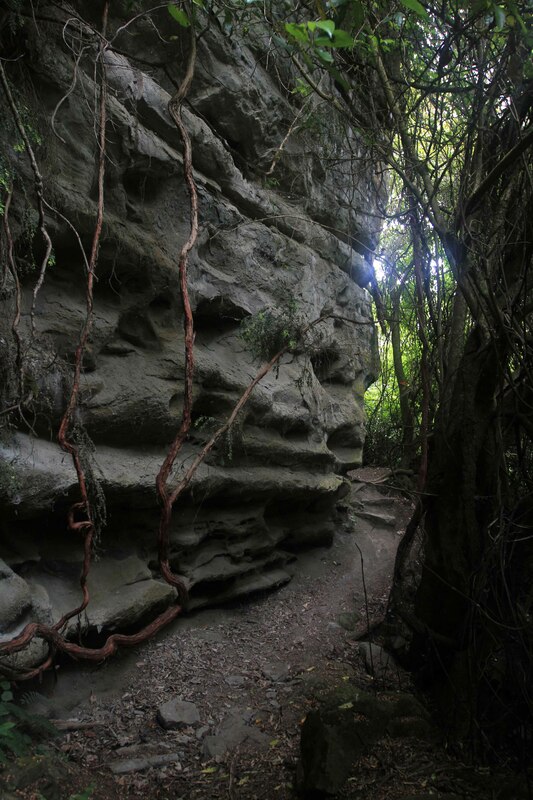 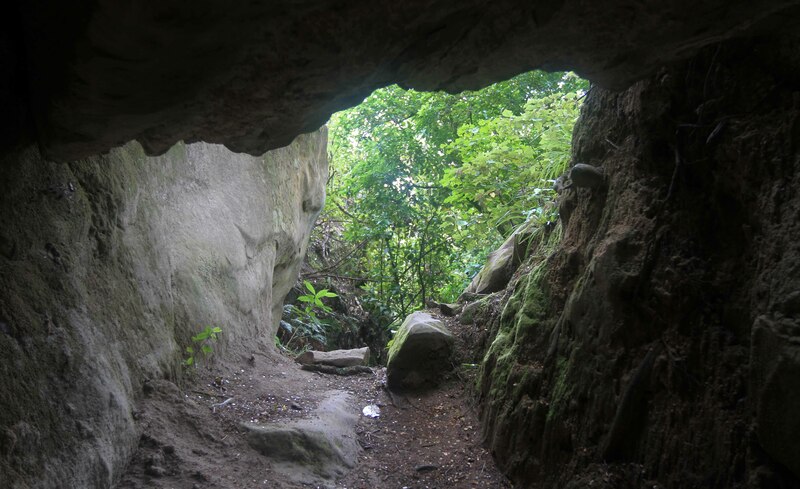 One of the massive boulders along the Onepoto Caves hike (a separate trail from the track (i.e. 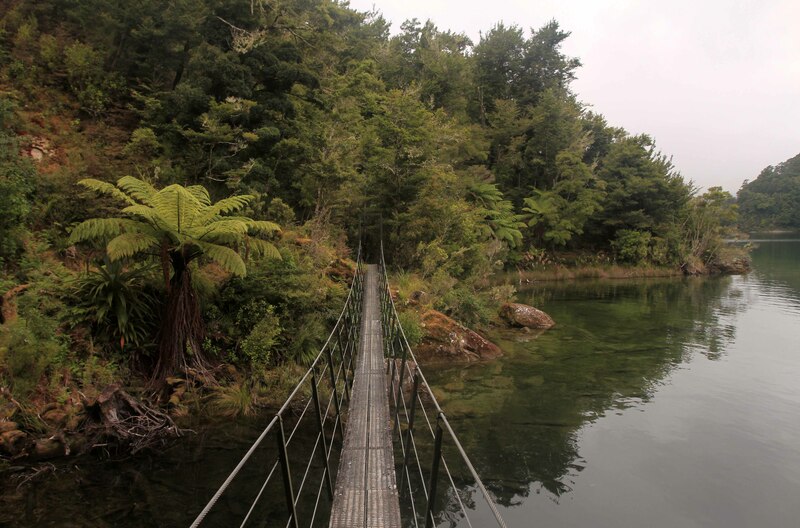 not part of the “Great Walk”), but still on Lake Waikaremoana. 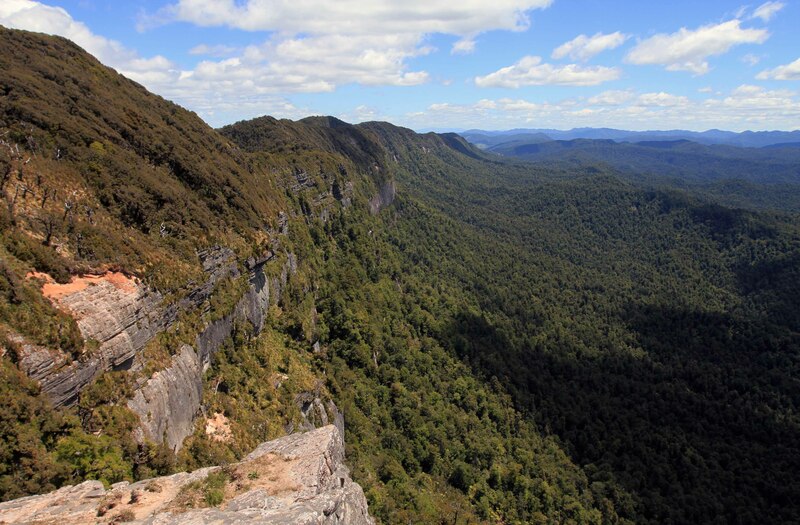 Looking at the Panekire Range from the Onepoto Caves trail. 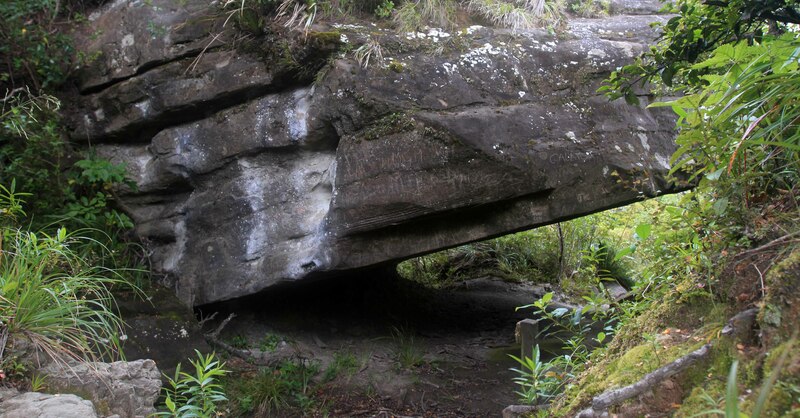 Large boulder on the Onepoto Caves trail. Looking out from one of the Onepoto “caves” – not really caves, just spaces between boulders and earth (the boulders came crashing down 2,200 years ago during a massive landslide which created Lake Waikaremoana).